1. 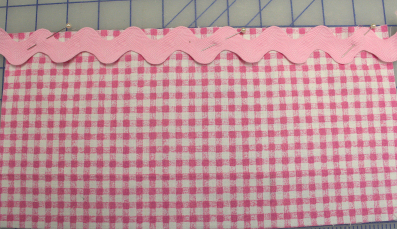 Lay one 12" x 6" accent rectangle face up on your work surface. 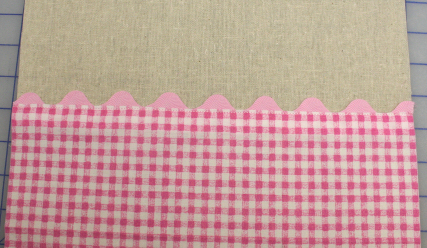 Align the rick rack along the top edge as shown in image. Sew through the middle. 2. Fold to the back and press. Repeat step one and two for the other accent rectangle. 3. Lay one 12" X13" rectangle face up on the work surface. Lay one accent rectangle face up on top aligning the raw edges at the bottom. 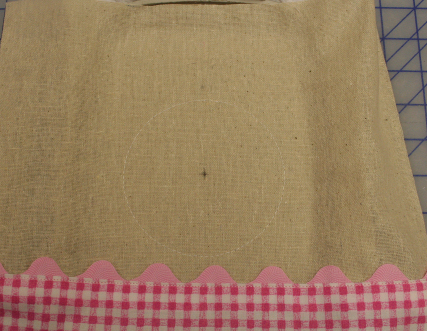 Pin and sew along the top edge of the fabric just below the rick rack. Repeat for other pieces. 4. 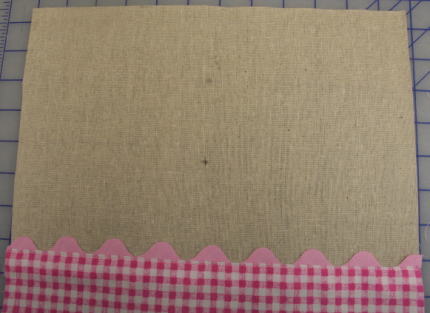 Lay one completed rectangle face up on the work surface with the layers at the bottom. Find the center of the top edge, measure down 5" and mark. Set aside. 6. Remove from the hoop. 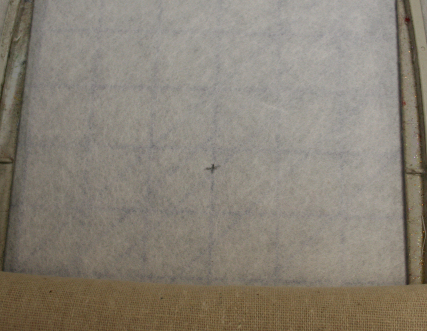 Cut the stabilizer to the same 5" square as the fabric square. 7. Hoop soft cut away stabilizer in a 5x7 hoop. Mark the center. Align the mark on your large rectangle with the one on your stabilizer. 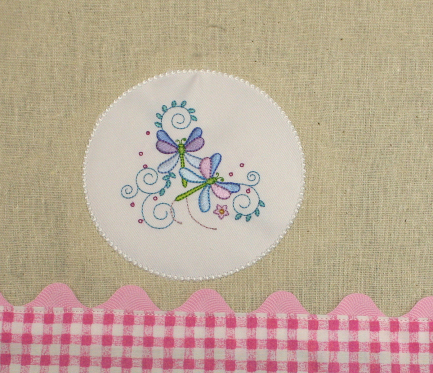 Use the label stick to adhere the fabric in the hoop around the edges away from the embroidery area. 8. 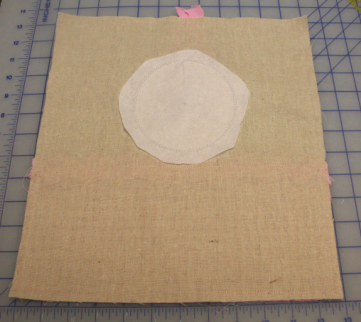 Embroidery the first color of the candlewick circle appliqué or the satin circle appliqué . (The candlewick appliqué is very narrow so if you do not have the appliqué snips to trim really closely you might want to use the satin circle appliqué.) Remove the hoop from the machine and place on flat work surface. 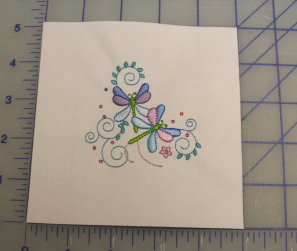 Use the Lapel Stick to put a little adhesive on the edges of backside of the 5" fabric square. Place on top of the circle run in your hoop making sure it is centered and fits inside the circle. 9. Embroider the second color of the appliqué ( I used white for all three thread colors so it would be sure to match my fabric.) Remove the hoop from the machine and place on flat work surface. 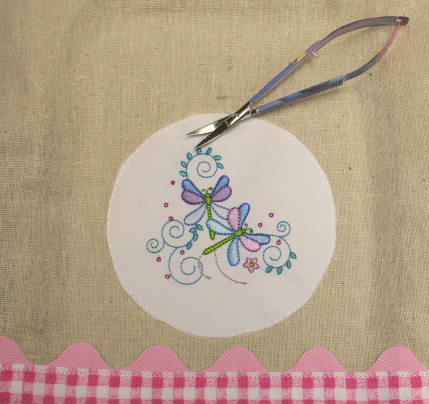 Using appliqué snips trim closely around the outside of the circle. 10. Embroider the last color of the appliqué. Remove the hoop from the machine. Cut away the excess stabilizer on the backside. 11. 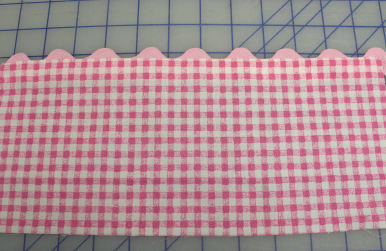 Place one fabric rectangle layer face up on the work surface. Place the other rectangle face down aligning all edges. Fold the 10" length of rick rack to make a loop. At the top center tuck the loop in between the layers and let the raw edges stick out about 1/4" at the top. Pin. 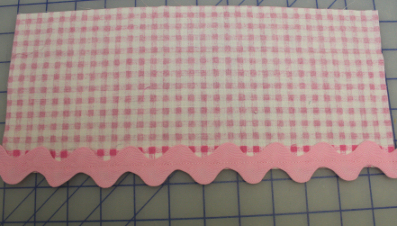 Using a 1/2" seam sew around edge leaving a 5 inch opening at the bottom for turning. 12. 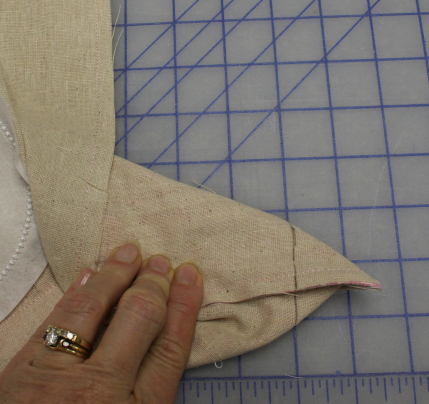 While still inside out pull out one bottom corner to a point aligning bottom and side seam. Measure in 1" and draw a line. Sew along the line. Repeat for the other three corners. 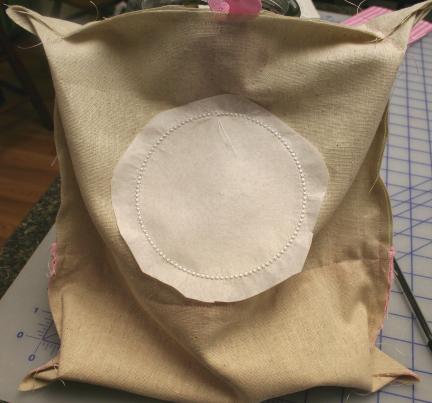 Your project should look something like a gunny sack. 13. Turn right side out. Poke the corners out. Stuff pretty full with the craft stuffing. Slide the bag of sand inside and add additional stuffing if needed. Sew the opening closed. When the door is closed it sits against the wall and protects it from the door knob that often hits the wall when the door is swung open. So, if you know someone who has a door that swings freely and won't stay open this little project may be just what you need. 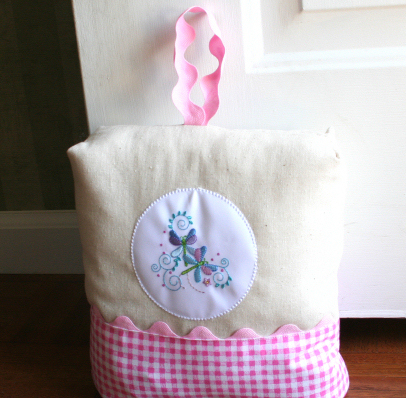 It is an easy project that could be made to match any décor. It is adorable ... good job!! !